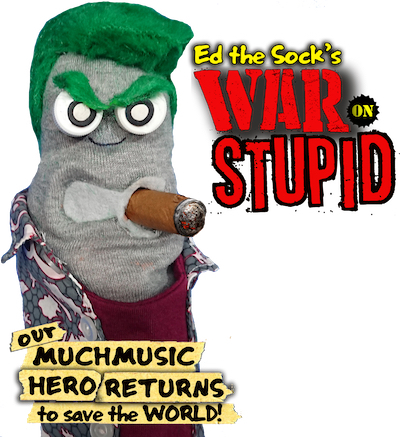 Canadian Icon, and star of Canada’s longest-running late-night show, Ed the Sock, is blazing through Western Canada on his War on Stupid Tour. Ed’s razor-sharp wit and fearless honesty have made him a hero to Canadians – especially us 90’s kids – and Right or Left, he’s going to spill your Kool-Aid. Ed’s War on Stupid multimedia tour tears it all apart, taking no prisoners and showing no bias. Tickets are available online now. VIP meet-and-greet/photo ops with Ed are available in limited numbers. In a special treat for fans of classic Muchmusic, Ed also unveils video clips of his interviews with celebrities & notable Muchmusic moments, spilling the beans on the backstage stories and celebrity politics never before revealed. I will draw one winner at random from all entries at 12:00pm on Thursday, November 22, 2018. For more information about the tour, and VIP meet-and-greet/photo ops, follow Ed the Sock on Facebook, Twitter, and Instagram. Update The winner is Jason! Ed the Sock was the funniest thing back in the day! I’d love to go to this. I’d love to see Ed the Sock again! It’s been too long, how have we survived?! When I grow up I wanna be Ed! It would be great to see this classic! what would the setup be like? …anyway really dig Ed the Sock!!!! I love Ed the sock he’s so rude and crude and awesome keeping it real!